Interested in Lean Training? UAH-ATN offers a wide-range of lean training opportunities – both as open enrollment classes where companies can send a few representatives to the training – and as customized training courses at your business site scheduled to accommodate your company’s needs. A complete listing of our lean training is available below. Our experienced and nationally renowned UAH-ATN staff provides instruction for all our lean training. Our open enrollment classes are posted on the UAH ATN training calendar or join our training newsletter to get regular updates. To schedule a training course for your company, please contact us or call 256.824.5326. Does My Company Need Lean Training First? Not sure where to start to include lean into your business operation? UAH-ATN staff are available for personalized company assessments. After visiting your location, our team will help you determine the most effective course for the implementation of your continuous improvement program. Please contact us or call 256.824.5326, so we may answer your questions and provide you with information to get you started today. The following three courses focus on the core components of a complete Lean Business Management System – the foundation blocks of a systematic Lean Business system model, the utilization of a value stream management process, and finally the development and communication of an organizational strategy and the roles leadership plays to ensure the company becomes a high-performance enterprise. Each course is a stand alone unit but we strongly encourage you to consider taking the entire training series and then at an additional cost, complete a foundational project agreed upon and supervised by the instructor to gain the maximum impact from the series. Certificates of completion are provided for each training unit, and Lean Practitioner certification is awarded for completing the three course series & the foundational project. Hands-on simulations and exercises are included in each section. While every organization desires to excel and improve at all levels of the company, very few grasp how to achieve true systematic, sustainable improvements. This course, with deep roots derived from the Toyota Production and Management System (Lean), provides an intro of a systematic Lean Business System model. Organizations cannot achieve sustainable high performance through isolaed process improvement alone. This course focuses on how to use the value stream management process to take a big-picture approach to ensure every improvement effort is focused on accomplishing increased value-flow to the end customer. Every successful organization begins with a clearly-defined strategy. This course will focus on developing and communicating an organizational strategy that will guide and align the efforts and activities at ALL Levels of the business. Hospitals need to eliminate anything that does not add value to the customer (the patient). They need to undertake a cultural transformation. The move to Lean management is just such a transformation. Lean management focuses on standardization and improving processes and reducing or eliminating waste and unnecessary activities, motion, or waiting. Lean management’s techniques are simple to understand, but putting them into practice takes perseverance. Our Lean Healthcare Certificate Series covers the Lean tools and their application in both classroom and hands-on simulation. Moreover, it focuses on the role of the Lean leader and the importance of having a vision for improvement and a strategy for effectively implementing the process of continuous improvement and sustaining it within an organization. We encourage you to review Lean Healthcare at UAH for more in-depth information along with services offered, a list of cross-disciplined UAH staff & faculty involved, and brief highlights of UAH student involvement. For direct assistance or questions regarding Lean Healthcare at UAH, please touch base with UAH OOE staff. A condensed 3-day course designed to introduce and implement lean concepts to your plant. Hands-on simulations provide lean improvement at all levels of the organizations supply chain. Through live simulations, take the first step in learning to make improvements on lead time, on-time delivery, quality and bottom-line profit. Understand the benefits of a Lean office vs. a traditional office environment. We’ll help you map a product’s production path (material and information flow) from “door to door” to help you visualize the areas that most need lean. Sort, set-in-order, shine, standardize and sustain to make information concerning quality, productivity, schedule and safety visually accessible at any moment. Learn to decrease changeover time to improve machine uptime and product quality, reduce work-in-process and lead times and allow for small batch sizes. Link and balance operations to reduce lead times, minimize work in process, optimize floor space and improve productivity. Control shop floor inventory by using visual signals when parts need to be replaced. Learn how to proactively maintain machines and equipment at peak efficiency and availability. 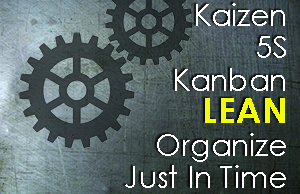 The Kaizen Facilitator Training course is designed to teach a standard kaizen process that can be used for implementing lean tools, such as quick changeover, 5 S, cellular/layout and TPM. Lecture material provides an overview of the background of lean, the eight deadly wastes of manufacturing and the lean tools used to eliminate those wastes. *Courses with an asterisk are included the Lean Enterprise Certification series. Does your company have employees who have attended Lean training, but need assistance to begin the process of lean implementation or continue lean implementation within your company? UAH – ATN offers on-site assistance with kaizen events and value map streaming site events. Contact us or call 256.824.LEAN (5326) to schedule. Aggressive goals are set early in the process and solutions are not simply put on paper but implemented by the team. Team members are empowered to offer and implement ideas, reinforcing the notion they are having an immediate impact. Kaizen events are a proven way to implement Lean tools and the greatest benefit is the nearly instantaneous recognition of improvement. This event helps companies focus on when and where they should apply Lean concepts to get the most impact. The result is an implementation plan that clearly prioritizes when and where to focus improvements and how each improvement will help achieve the future state. After the event, you will have a current-state map, future-state map and an implementation plan of your own value stream.